A quasar, which stands for quasi-stellar radio source, is the active nucleus of a galaxy seen from across the universe. These extremely energetic and active galaxies come from the early universe and display a high redshift. Quasars are commonly found clumped together and are called LQGs, or large quasar groups. One such LQG recently discovered by researchers at the University of Central Lancashire, England (UCLan) is believed to be the largest known structure in the universe. To get an idea of the size estimates in the universe, a galaxy such as the Milky Way spans about 100,000 light-years or 31 kiloparsecs. (1 kiloparsec equals 1,000 parsecs equals 3,259 light-years.) The distance between the Milky Way Galaxy and the Andromeda Galaxy is about 0.75 megaparsecs or 2.5 million light-years. A cluster of galaxies can span 2 to 3 megaparsecs. Some LQGs already known span about 200 megaparsecs across (652 million light-years). But the newly discovered LQG, at its longest dimension, is 1200 megaparsecs, or 4 billion light-years across. If we could see this superstructure in visible light when we looked up into the sky at night, it would be cover nearly 20 degrees of sky, or 40 full moons placed side by side. 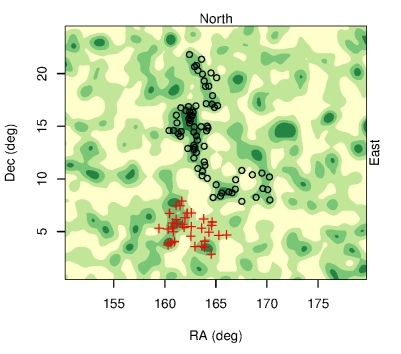 The black circles represent the quasar sources that mark the largest LQG ever discovered. The huge size of this LQG might have astronomers rethinking Einstein's Cosmological Principle, which states that when viewed on a sufficiently large scale, the properties of the universe are the same for all observers. Astrophysicists had believed that they wouldn't find objects larger than 370 megaparsecs. Even the newly discovered LQG's average dimension of 500 megaparsecs broke this amount, while its longest dimension shatters that notion. The scientists at UCLan who made this discovery have other candidates they are investigating that will probably end up bolstering the idea that the 370 megaparsec constraint is too small.